This article is about the province. For its capital city, see Lima. For other uses, see Lima (disambiguation). Despite its small area, this province is the major industrial and economic powerhouse of the Peruvian economy. It concentrates almost one-third of the country's population and 50% of Peru's GDP in 2012. The province was created in 1821 as Peru's territory was divided into departments, provinces, districts and parishes. The province was part of the Lima Department, which was formed by the territories of present-day Lima, Callao and Ica regions, and the provinces of Casma, Huarmey and Santa, which later would be part of the La Costa Department. The department was further subdivided as time passed but the Lima Province kept being part of it. Due to the massive migration from other areas of the country, the need to separate the province from the rest of the department was forecast by experts. In 2002, the new regionalization law passed by President Alejandro Toledo made the Lima Province a separate entity from the rest of the newly created Lima Region. The province is divided into 43 districts. Each of them is headed by a mayor, although the Metropolitan Lima Municipal Council (Municipalidad Metropolitana de Lima), led by the mayor of Lima, also exercises its authority in these districts. All the districts of Lima province are fused together in a continuous urban area, with the exception of the beach resorts of Ancon and Santa Rosa in the north and Pachacamac, Punta Hermosa, Punta Negra, San Bartolo, Santa Maria del Mar and Pucusana in the south. Plaza Mayor in Lima, Peru. Andean Mountain basal stone monument in Lima, Peru. 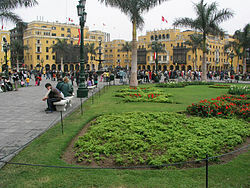 Lima Province is administered by the Metropolitan Municipality of Lima (Municipalidad Metropolitana de Lima), which also administers the city of Lima. Its current mayor is Jorge Muñoz Wells (2019-2022). From April to December, Lima is often covered in coastal fog and mist, while in January to late March, the weather is generally sunny. Lima has various tourist destinations and activities, including pre-Inca period pyramids, museums and modern shopping malls. There are many restaurants, some of which specialize in fresh seafood, bars and nightclubs. There are many beaches for sunbathing, swimming and fishing. ^ a b c d Lima Travel Information from Lonely Planet Travel Guides and Travel Information. Retrieved August 2009.